You asked and we delivered! This strap is clean and stylish and it will blend into your life like it has always been there. This black leather is the most beautiful Italian vegetable tanned leather we have ever seen. It is 3mm thick, the perfect combination of comfort and durability. Every strap in the New Simple 40 range has no accent stitching on the main body for a super minimalist look and the ultimate comfort. The edges of the strap are hand finished and waxed so they are round and feel super soft against your skin. The ends are stitched with matching thread and blind embossed with a subtle Lucky logo. This strap is crafted to last a lifetime, it will get softer and softer with every use! Our Simple 40 range is not too thick and not too thin, it's just the right size for almost any interchangeable lens camera. It's name comes from the design philosophy, we aimed for a minimalist look to compliment you camera without distracting from it. The construction of the main part of the strap uses just one thicker piece of leather rather than two like our Slim 30 and Standard 53. The leather we have chosen looks great and softens up after just a few uses. It will have some natural marks especially on the back side which is unfinished. This unfinished back also provides the perfect amount of grip and slip for using this as a cross body or shoulder strap. The Standard Length is little longer than a stock strap, perfect for using as a traditional neck strap or hanging off one shoulder. Also works as a cross body strap for most people up to about 170cm (5'7" tall). Our Long Length strap are 25cm longer than our Standard Length which makes them better for wearing across the body for people over 170cm (5'7") tall. More detailed info on choosing a strap here. Will it fit my camera? This strap will work with almost any camera, especially larger DSLR setups with heavy lenses. It attaches in the same way as the stock strap that came with your camera, so basically any camera that has a set of 10mm webbing slots or rings will work! Click here for more info. 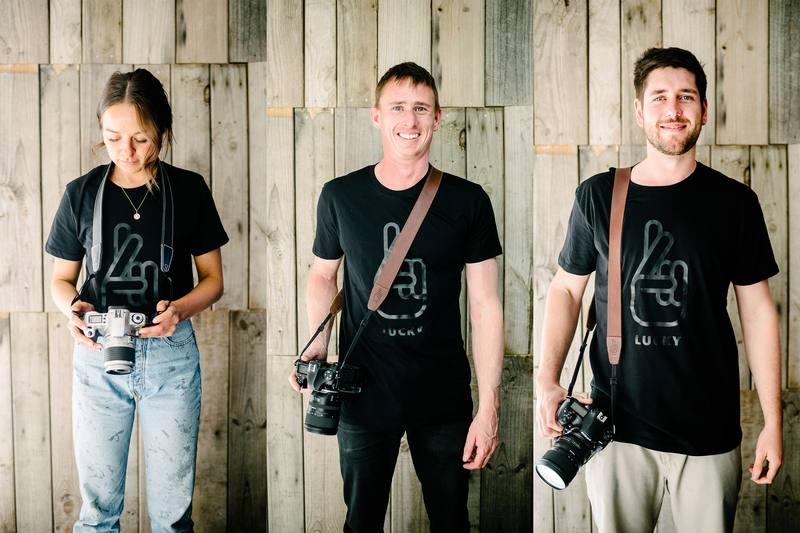 We have designed these straps to be worn all day with the heaviest pro DSLR setups so you can rest assured they are strong enough. If you are looking for a weight I have lifted a 40kg barbell with a strap without it breaking, but I hope your camera is not that heavy! 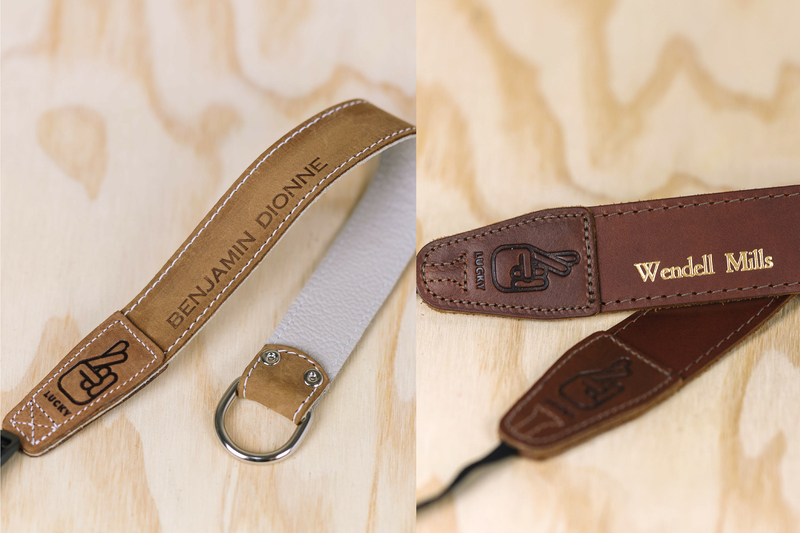 You can personalise your Lucky Camera Strap with custom embossing! It could be your name, an inspiring quote, your business name or even your own logo! Prices start from AUD$35.95 and you can select the options right here on the product page before adding your strap to the cart. For more detailed information and examples images click here. Great quality, well made Australian product. The soft feel and smell of leather have put me back in touch with my photography. I had been looking for a longer and wider strap for some time so was very excited to find Lucky Straps and their great range. I was even more excited when it arrived and I fitted it to my camera - it more than met my expectations! Love the feel and smell of real leather! Well done guys for a great product! When i accidentally stumbled onto Lucky Straps, I immediately knew these products would be first rate. I purchased a black Simple 40 Long, and I was not disappointed. This strap is a ripper - beautifully made, a grade materials and comfortable from the first use onwards. Don't bother with a strap with a whole heap of fiddly bits, get one of these. Everything you need, nothing you don't. I love well made leather products and this certainly is one. I like these straps so much that I ordered another longer strap for over the shoulder. Fast delivery. Highly recommended. I love! this strap and its simplicity, Im not much for labels so just love getting away from all the Nikon and Lumix branding with this sleek design and its allot softer making it nicer in the hand than any conventional production camera Strap I have used before but it feels really reliable on the shoulder.